How can she expect anyone to believe her–when she can hardly believe it herself? FBI special agent Nick Bradley has seen his share of kooks during his fifteen years with the Bureau. But Rachel Sutton is an enigma. She seems normal when she shows up at his office–until she produces a tattered Raggedy Ann doll and tells him about a strange feeling of terror it gives her when she touches it. Nick dismisses her, only to stumble across a link between the doll and an abducted child, setting in motion a chain of events that uncovers startling connections–and puts Rachel’s life on the line. Filled with palpable suspense and heartwarming romance, In Harm’s Wayis the final installment of the thrilling Heroes of Quantico series. In Harm’s Way, by Irene Hammon, is the third book in a series called “Heroes of Quantico”. When I first received the book, and realized it was the third book in a series, I was concerned that I might not be able to fully understand the characters because I hadn’t read the first two books. I was pleased to find, however, that I had no reason to be concerned. Unlike many series, I was able to pick up this book and delve into the story without worrying about any of the previous books. The novel starts with a kidnapping, a Raggedy Anne doll and a young music teacher who, upon finding the doll, has a tremendous reaction to it that she cannot explain. She decides to go to the FBI to show them the doll, tell them her story and be done with whatever is causing her concern when she touches this doll. An eager tabloid reporter, who overhears her telling her story to a friend, puts a glitch in this plan. The story continues to evolve, leading to romance, kidnapping and a family reunited. I must admit – I really enjoyed this book! It was the type of novel where you suspend your disbelief and simply engage yourself in the story. It touches on all types of interesting things about what people believe – from the concepts of psychics and twin “connections” to spirituality and religion. It lays an understanding framework about the ability to hold multiple beliefs at the same time. It also speaks volume to the idea of the overwhelming power of love. I’d highly recommend this novel because I enjoyed the balance of many elements – mystery, suspense, romance and varied beliefs – all at the same time. I think I will be looking for other books by Irene Hannon because her style of writing and character development are enjoyable to easy to read. 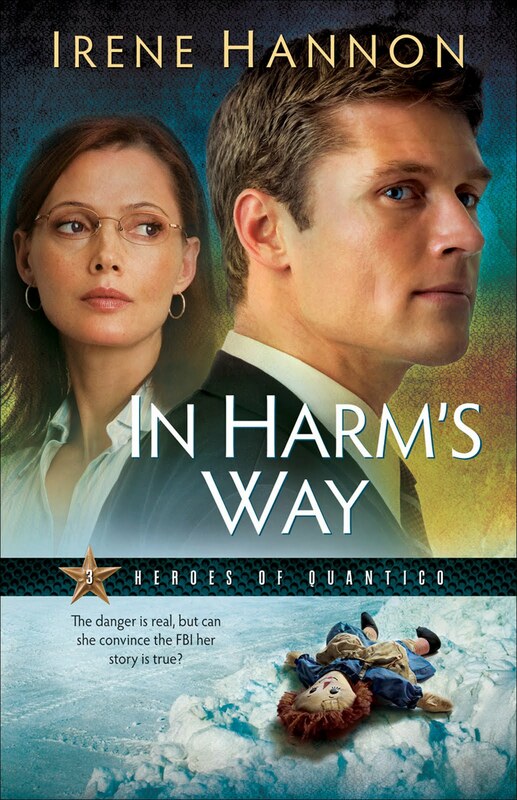 I think the “Heroes of Quantico” series is interesting and I really liked In Harm’s Way!